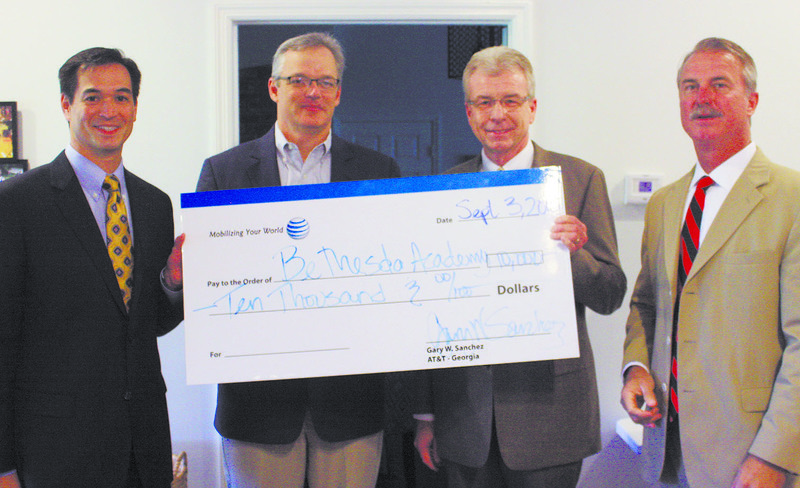 Bethesda Academy, an award-winning school for boys in grades six through twelve, received a $10,000 donation from AT&T to support the outstanding academic programs and activities for students. Gary Sanchez, regional director of external affairs, presented the check to Bethesda Academy president David Tribble and board of governors chairman John Helmken in honor of Lee Hughes, former Bethesda board member and AT&T government representative, at a special check presentation on the Bethesda campus yesterday, September 3, 2015. Bethesda Academy features a blended learning curriculum designed specifically around the ways boys learn most effectively, providing a supportive environment for a diverse student population. The school offers a wildlife management program, on-site video production studio, organic farming program, a nationally-ranked chess team and state champion basketball team. For more information, please contact Andrea Dove at andrea.dove@bethesdaacademy.org or 912.644.4376.